There are over 100 wildfires currently ravaging New South Wales, the biggest of which just burned 182,000 square miles (470km2) in the Blue Mountains. According to Australia's Rural Fire Service, this particular blaze was "started as a result of live ordnance exercises" at an army range. The Defence Department didn't comment, but said there's an internal investigation into the explosives training exercise recently conducted at the Marrangaroo training area. 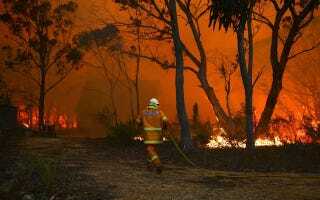 Army ranges across Australia are failing to develop bushfire plans in accordance with Defence rules. A source with close knowledge of army training area management said Defence brass knew of the shortcomings in setting up bushfire plans but had not acted because of a lack of resources. Army personnel who expressed concern about the lack of fire management plans had been told ''don't worry … we will get to it'', the source said. But leaked internal Defence correspondence, seen by Fairfax Media, indicates that Defence's Directorate of Training Area Management knew that ranges across Australia had failed to implement bushfire plans, even though such plans were demanded in a 2011 fire protection manual. Since last Thursday, owing to the over 100 wildfires now blazing across New South Wales, more than 200 homes have been destroyed, and there has been one fatality. This is very unsettling to Australians, as the wildfire season doesn't typically get underway until January.